Hair loss is a subject not often discussed among women, but around half the female population will experience it at some point in life, and Muslim women are no exception. If you are a Muslim woman with hair loss, however, you may find your problems compounded. 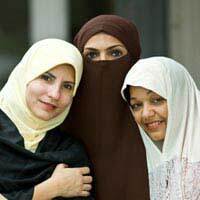 Traditional attitudes to hair may mean that you feel particularly anxious about retaining your femininity, and non-Muslim friends may not understand why using a headscarf doesn't make it all okay. Can the Hijab Cause Hair Loss? Often women who have just taken up wearing the hijab find that more hair than usual is starting to come loose when they comb or shower. Most often this is due to a pre-existing hair loss condition made worse by the hijab. The good news is that it's usually treatable – you just need to get used to the different kinds of care your covered hair needs. Overall, the hijab is good for your hair. By protecting it from pollution and dirt, it can keep it in great condition. Many hijabi women find that they can grow their hair longer than they could without – so don't despair, just take extra care. The hijab can exacerbate hair loss for two reasons: it can rub against the scalp, and it can cause a build-up of oils at the roots of the hair. You can work around the first problem by first covering your hair with a cap or bonnet. Avoid synthetic fabrics – cotton is best for allowing your scalp to breathe. Because covering the hair means the scalp is constantly under gentle pressure, it stimulates oil production. This can provide food for organisms that go on to damage your hair – one reason that dandruff is more common among hijabis. Use a shampoo designed for oily hair and wash your hair more frequently. Never put your hijab on while your hair is still wet, as this can create an ideal environment for infections. Some types of hair loss conditions mean that it is advisable to wash your hair less often. If you are advised by a doctor that you have a condition of this type, it is not necessary for you to wash your hair in order to be purified; you are exempt by reason of infirmity. You can do tayammum instead, though you should first check with your doctor that this will not damage your hair – in most situations it will do you no harm. A common cause of hair loss among Muslim women is Traction Alopecia. This is caused by physical strain on the hair when you tie or clip it back too tightly, whether you then cover it or simply wear it in a modest style. It often causes the hair to thin at the front of the head, and it is particularly problematic for women with afro hair, which is more fragile than other hair types. If you don't want your hair to be entirely loose, the simplest solution to this is to keep it in a loose braid or bun fastened with cloth ties or lightweight plastic clips. Avoid metal clips that dig into your hair. Many Muslim women do not realise that it is not contrary to Islam to choose short hairstyles. These are a good idea if you suffer from a condition where the weight of your hair is contributing to hair loss. Shaving your head is not normally permitted but even this can be allowed if you are suffering from a serious illness; for instance, if you are losing your hair due to cancer treatment you may shave off the remaining part to make it look neat. For more advice, read our feature Coping With Hair Loss For Women. When cutting hair for a hair mineral analysis, the distal ends are discarded. For many Muslem women their religion dictates that any part of the body that is seperated from them must be buried. Offer them an envelope with the unwanted hair.